Order online this Thriving Togetherness Roses and Gerberas Arrangement and thereby satisfy, with fulsome hearty fervor, the flower urge of your lady love. 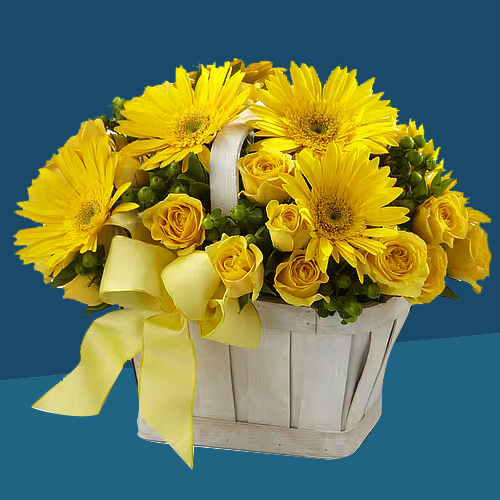 This Bunch showcases a mind-filling Meet of exotic 15 Yellow Roses and comely 5 Yellow Gerberas. Flowers Delivery Churu, Send sweets Churu, Wedding Cake Kurukshetra, Diwali Mithai Siwan, Send Flowers and Gifts to Mhow, Online Shop Navsari, Flower to Bijapur, New Year Flowers Puttur , Fresh Fruits Udipi, Send Gift Bharuch, Dry Fruits to Gaziabad, Birthday Delivery Jallandhar, Sending to Jallandhar, Flower shop Rajkot, Sangli Online Cake Delivery.